Like a mountain mirrored in a lake. The same mountain, but upside down, underwater. It might be in the realm of the gods, or like a shadow, or complementary. What was high is now deep, what was down at the foot is now undeep, close to the surface. Qián yao, the mirrored line. If it was high up the Mountain, it is now deep in the lake, what was at the foot is now at the surface of the lake. “The sea in which the primary hexagram swims” (Karcher), or the landscape in which something happens. In old texts, there is no mention of first and last, or first going to second. Both can "be" at the same moment, although they have a different meaning. Zhi is only used for one line at a time, but with more changing lines I think it is natural to call the relating hex also zhi. 之 zhi: its, his, her. Possessive. 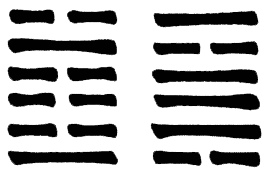 Same line but in related hexagram (eg 44.1 and 1.1): like the other end of a washing line across a street. They carry the same load of laundry, but seen from the window on the opposite side of the street. The laundry has now an opposed sequence. What was up front is now in the distance. There are no texts before the 11th century where the concept of changing lines is mentioned. Their first appearance is in the writings of Ouyang Xiu (1007-72). 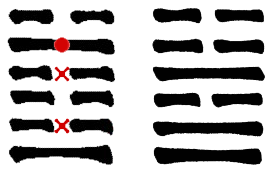 In the 4th century BC, in the Zuo Zhuan, a line of a hexagram is indicated by the hexagram it changes to. Qian zhi Da You is hex.1, line 5, or "hex.1's hex.14". Zhi can mean 'moving to', but probably it means simply 'its', a genitive particle, like qí. In one Zuo Zhuan-story zhi and qi are used alternatively. In the explanation of the oracle they did use the changes in the trigrams though. Water changing to lake etc. (information from Rutt "Zhouyi"). The fanyao is a specification of the relating hexagram. It does not change anything about it, but specifies what part of it is related to your question. 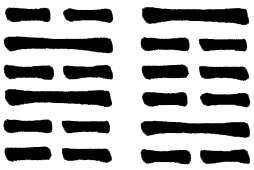 An example: years ago, before I had a computer, I wanted to make an Yijing (back then I Ching) which would go all over the world. There was no chance at all that it would ever happen. Still I knew that this was what I was going to do. I asked Yi and got 16.4: Letting the weaving of images sprout. There is great achievement. Do not doubt. Partners unite like hair in a clasp. It gave me the courage to go on believing in it. Let my enthusiasm and imagination sprout, make a good book and don’t doubt. Some day others will connect. The fanyao of 16.4 is 2.4, the closed bag. That was an apt description of how I was working. In silence, alone, nobody knew anything about it. I told nobody about my goal. But then, in the nineties, the incredible happened. I got a computer and not so long after that, I had my website and got more and more visitors from all over the world. Without the fanyao 2.4 I would have thought that I had to find partners. But looking from the other side, or rather from the side of the situation the way it was, I could understand that the fact of the closed bag told me simply what was happening and there was nothing wrong with it. This is how things are, and in that space I just had to sprout the germs of enthusiasm and imagination. Like a negative of a photo. Like hex.1 and 2, or 3 and 50, or 27 and 28. Same image, but the light is totally different, what was (in the) dark is now light, what was (in the) light is now dark. In 3 things are starting, in 50 things are settled. Ban xiang, 'half-images': upper and lower trigram. Called zhen and hui: zhen is ‘given’ or enduring and is 'inside'. Hui means regret, has to do with actions and what happens and other people and is 'outside'. Other names or descriptions: inner and outer, lower and upper, coming and going, earlier and later, beginning and ending, growing and dissipating. 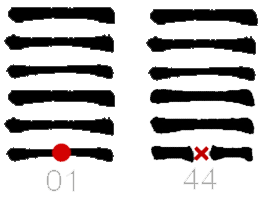 Jiao gua, exchanged or interchanged trigrams: trigrams zhen and hui switched. E.g. 39 and 4. What was inside goes to outside, what was above is now below. What was a given is now uncertain, what was going out is now coming in.